Crooked teeth are embarrassing! Did you know that your teeth are one of the first things people notice when they first meet you? No wonder you don’t want to smile for the family photo! It’s always on your mind when you feel self-conscious about your smile. Whether you’re an adult, teen or child, orthodontics is an option that will help straighten your smile. Orthodontics is dentistry specializing in straightening teeth and correcting the bite. Here we’ll discuss everything you need to know about braces and orthodontics in Canton, MI. Traditional orthodontics utilizes metal or clear brackets and a wire that is applied to your teeth and uses gentle pressure to move your teeth gradually over time. You’ll visit your doctor every two to three weeks to make adjustments to your braces that will shift your teeth and correct your bite. Most traditional cases take anywhere from 12-24 months to complete depending on the severity of the case. Braces are the best way to correct a misaligned bite and they work well for smaller children and adolescents. 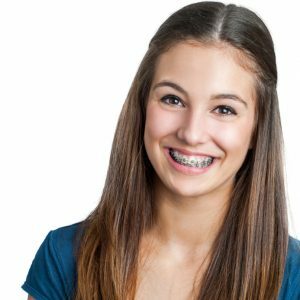 Many teens or adults may not want to wear braces because they’re quite noticeable and you typically need to wear them for a number of months or years. For those adults and teens, Invisalign may be an option. Invisalign uses clear plastic aligners to straighten your teeth instead of traditional brackets. Because your aligners are designed to fit snugly, they’re virtually invisible when you wear them. Your aligners will need to be worn for 20-22 hours per day, but because they’re removable there are no diet or food restrictions as there are with braces. You’ll change your aligners out for a new pair every two weeks. Invisalign aligners can also be removed for brushing and flossing so your home care routine will not suffer as you’re straightening your teeth. Most Invisalign cases can be completed in around 12-18 months, which is sometimes a shorter time than traditional braces. For all of these reasons Invisalign offers great benefits to busy adults and teens who would like to straighten their teeth discreetly. At Robinson Dental Group, our team is highly skilled and well equipped to meet all of your orthodontic needs whether you’re considering braces or Invisalign. The first place to start is a consultation with our doctor who will create a plan for your newly aligned smile. You may even be able to see what it will look like before starting treatment in some cases. Don’t let crooked teeth or an embarrassing smile hold you back any longer! Contact our office to learn more about the options we offer for straightening your teeth.